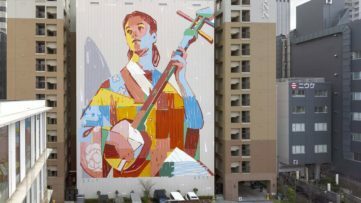 Another week is behind us, and it is time for our regular recap of some of the best murals, done in the past week, which you probably saw, fresh from the streets, on our Facebook page. 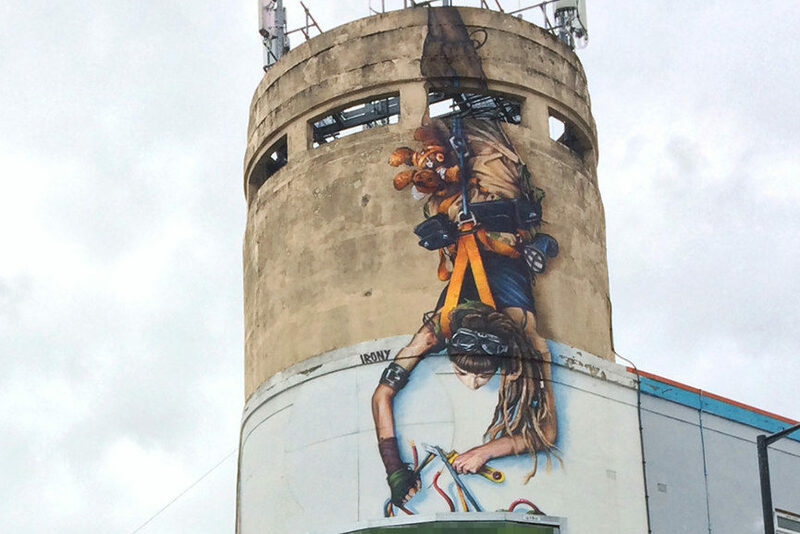 The UpFest in Bristol and Malta Street Art Festival are officially closed, but don’t worry, the summer isn’t over and there are still more festivals to follow in 2015. 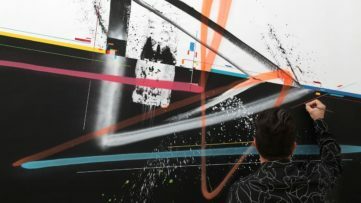 One of the largest street art interventions happened last week as the whole Mexican district was turned into one grand mural and an interesting public art event was documented by our friend, urban photographer Henrik Haven in the city of Horsens, Denmark. 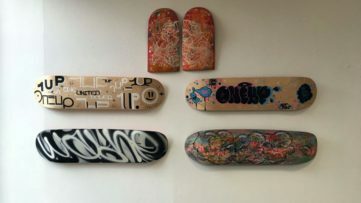 Further on, as you probably know we are doing a summer street art special and in the last couple of days you had the opportunity to check out our suggestions on how to make a mural and read about some unconventional graffiti materials. But let’s get back to the chase and see which murals captured your attention during the last seven days. Scroll down and have a look…. Julien “Seth” Malland, better known as GlobePainter recently did an astonishing piece on one of the buildings in Montreal. Famous for his playful and colorful characters Seth made a mural in his recognizable style depicting two children running into one another. 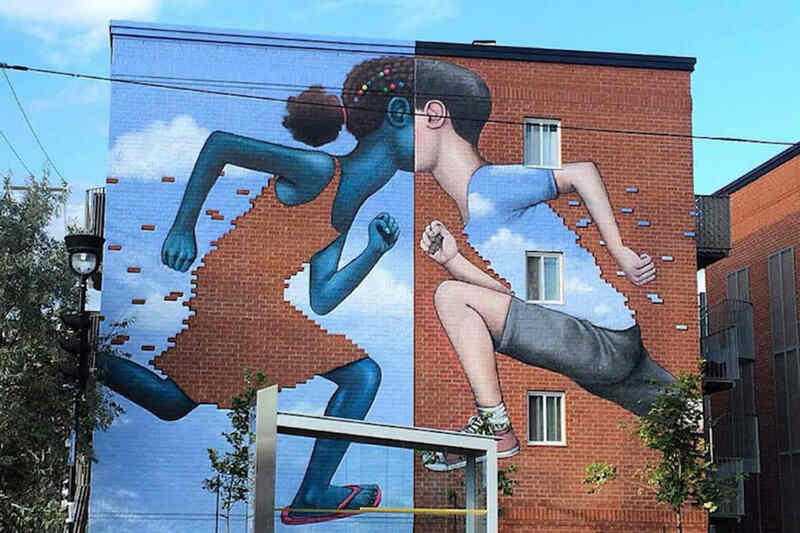 The best thing about this recent piece in Montreal is the amazing composition with two part mirroring each other which is achieved through Seth’s clever use of the building brick exterior, and the background depicting clouds found on both parts of mural design. British artist Irony was also one of the participants in the UpFest street art festival in Bristol. Irony painted a mural on the wall of the Redpoint climbing center, depicting a female figure hanging from the top of the building. The girl all geared up and ready to climb the walls, or hang from them, seems to perfectly fit and describe the purpose of the building. This female figure is also a perfect example of the distinguishable style of this UK artist. 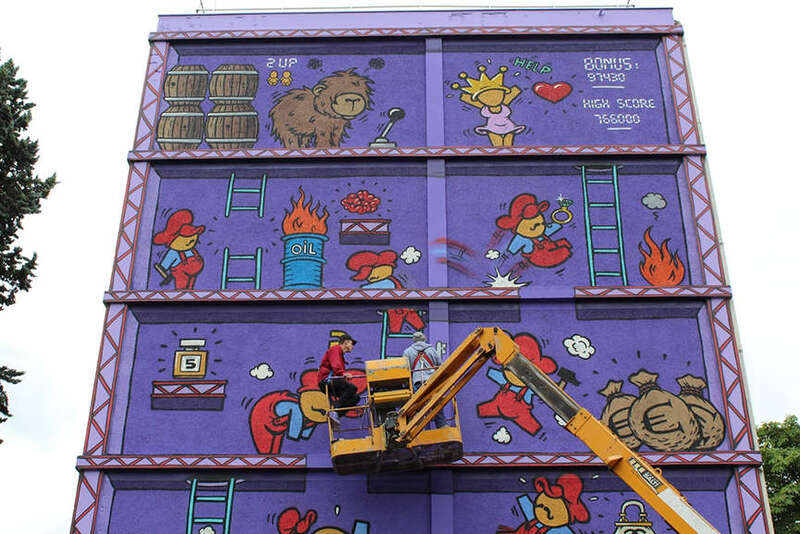 Belgian artist, Dzia Krank recently visited Glasgow in Scotland and he wasn’t wasting his time to be sure. He is well-known for his detailed animal pieces and he made several of them during his visit. What caught our eye is his Cecil the Lion artwork, a tribute to Southwest African lion recently killed after he was wounded with an arrow. This street art piece commemorates the life of the 13-year-old habitant of Hwange National Park in Matabeleland, Zimbabwe, the animal loved dearly by the local community members. 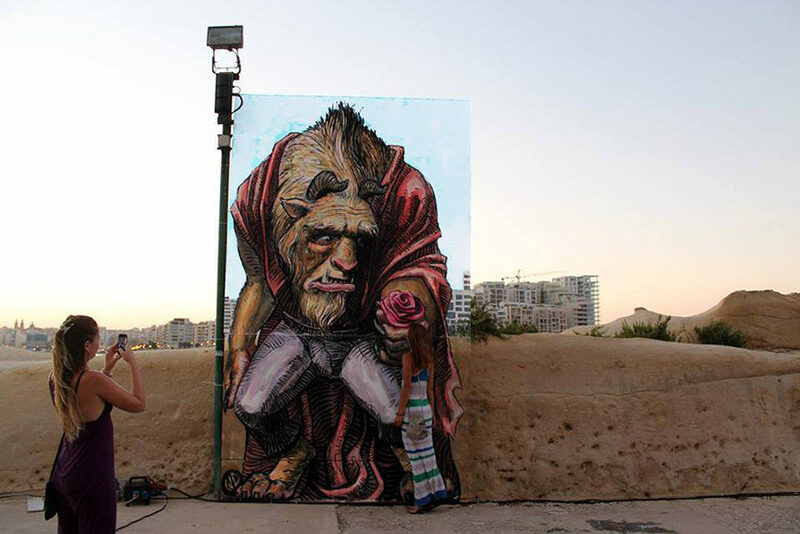 Another great artwork made for the Malta Street Art Festival is mural … and the Beast inspired by the character of a well-known Disney animated movie. The artist behind the Beast mural is WD aka Wild Drawing, a Balinese street artist currently living and working in Athens, Greece. His work in Valletta realistically depicts this lovable cartoon character, capturing his wild and at the same time sad figure looking at his magical rose. 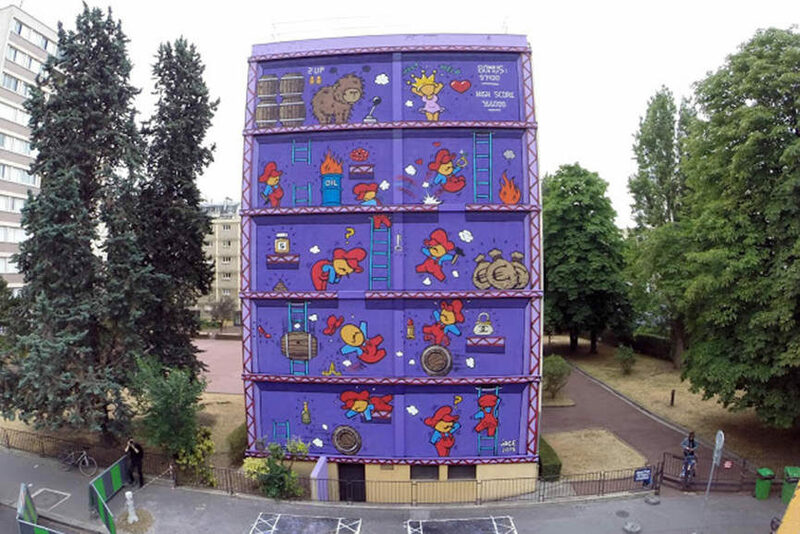 An amazing work by the French artist Jace was created in Paris, inspired by the Donkey Kong video game, a prequel to the Mario series, which brings some happy memories of childhood for those who had the opportunity to play the game. Gallery Matgoth was involved in the project providing a financial help, and making the mural possible. The Donkey Kong imagery was merged with “les gouzous”, small humorous characters which became a trademark of the work of Jace throughout his career. The final mural in our weekly reminder of the best street artworks is The Mediterranean Tunnel painted by the French artist Mateo aka MTO. This truly innovative piece, or shall we say two pieces, as they are painted on different locations, is a political statement as much as the original artwork. 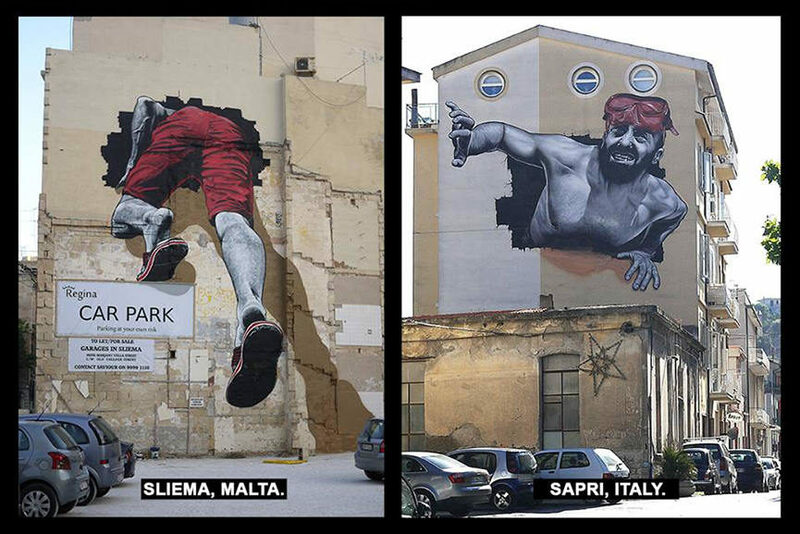 First mural was created in Sliema, Malta depicting a man entering the hole in the wall on one of the buildings, while the other is in Sapri, Italy showing us where the tunnel ends and the face of the man emerges. 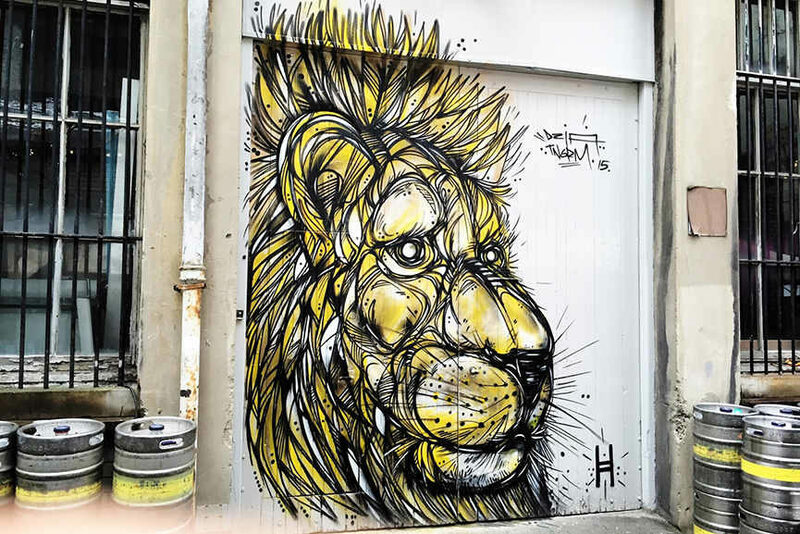 For more amazing news from the streets worldwide create your profile via MyWidewalls for FREE!